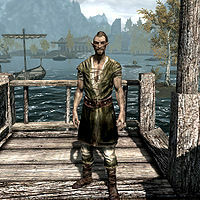 Valindor is a Bosmer warrior who was born in Valenwood. He spent most of his childhood playing in the towering trees that grow there with his brethren. He became the apprentice of a master armorer in Silvenar and was later urged by his master to take over his business; however, he turned it down and decided to wander Tamriel instead. Now living in Riften and working at Riften Fishery, he almost regrets his decision to leave home. Valindor starts off his day by waking up at 4am and having a long breakfast for two hours in his house. At 6am, he heads off to Riften Fishery and starts working for three hours. At 9am, he goes outside to the docks and works on the fishing boat for three hours until noon. Then, he heads back inside the fishery and works for three hours until 3pm. After that, he goes outside to the boat again and works for another three hours. At 6pm, he finally stops work and proceeds to Haelga's Bunkhouse to consume his dinner and rest for four hours. At 10pm, he returns to his house to sleep for six hours until 4am, and repeats his schedule the following day. Valindor wears a set of farm clothes along with a pair of boots. He carries the key to his house, a leveled potion, and a selection of common items and gold. He wields a leveled dagger in combat, which can be up to elven in quality. Valindor will greet you pleasantly, however he informs you that the fishery is not hiring: "Well met. I don't think they're hiring anyone at the moment, so if you're looking for work, you're out of luck." He will then change the subject and comment on the local scenery: "The trees... they're beautiful here. Reminds me of autumn at home." He then discusses his life when he was back at his home, stating, "The fall forest makes me miss my childhood; playing among the towering trees in Valenwood and living with my brethren." With the happy memories of Valenwood fresh in his mind, he makes a bitter comment about his current location: "Seeing the sorry state of this city almost makes me regret my decision to leave my home when my apprenticeship completed." He then tells you about the apprenticeship, saying, "I was fortunate enough to be guided by one of Silvenar's master armorers until he passed." He will then elaborate on his master's death: "On his deathbed, my master urged me to take over his business but I decided against it. I chose to wander Tamriel instead." He seems to regret that decision, as he states, "Now here I am, working for this dreary city's Fishery. I sometimes wonder why I don't just move on." With the Dawnguard add-on installed, Valindor can be made into a vampire as part of a quest given by Vingalmo should you side with the Volkihar vampires. After being turned into a vampire, Valindor will undergo the usual appearance change and offer new dialog telling you, "You've given me a great gift friend. The night air hums and the shadows are full of color." and: "Make use of my coffin whenever you like. My home is your home." He also notes that now his (un-)life is constantly in danger: "We are blood bound, but we can never be too careful. Never know who might be watching, right?" As the target of the New Allegiances quest, sometimes Valindor is ridiculously difficult to sneak up on, detecting you even at very high levels of Sneak. If you own Honeyside, he can be seen occasionally walking through it from the harbor into the city proper. You might not be able to be pickpocket Valindor if he is selected as the "mark" for the Thieves Guild quest The Fishing Job. Simply cancel the job with Delvin Mallory. ? Esta página foi modificada pela última vez à(s) 20h46min de 5 de setembro de 2015.